Villa Tyche is situated in a secluded area of Secret Valley, with uninterrupted coastal views (for people who have holidayed in this area before we are located in area known as area 'B'). Situated at the end of the cul-de-sac you will see the driveway to Villa Tyche. The gardens and pool are on the other side of the villa offering privacy and coastal views. As soon as you enter Villa Tyche you are met with a wall of glass giving an uninterrupted (apart from the odd palm tree!!) sea view. The lounge area is comfortably furnished with 2 x large settees, 42 inch flat screen tv, satellite tv box with some UK Channels and two additional ceiling fans for people who do not like to use the air conditioning. Patio doors run along the full wall looking out to the patio, pool and mature garden area, with sea views. Vertical blinds are fitted to all the windows but are rarely closed! The circular dining area is furnished with a table and 6 chairs, windows surround the 'turret' and look out to the garden area and beyond to the sea. Large fully equipped kitchen, fitted new for 2019, with cooker, dishwasher, washing machine, microwave, fridge freezer, toaster and coffee machine has an open plan aspect throughout. The master bedroom has a king size bed with en-suite shower room (with vanity unit for storing your toiletries), dressing table, bedside chests. All bedrooms have floor to ceiling wardrobes. Outside the bedroom patio doors there is a private seating area with a bistro table set overlooking the side garden. There is an overhead ceiling fan fitted in addition to air con unit. Black out blinds complete the room, allowing a lie in if desired and also keeping the room cooler during the hotter months. The second bedroom, looking out over the green area has two single beds, wall mounted vanity shelf, air con unit and the windows have black out blinds. This twin bedroom also has its' own en-suite bathroom with overhead shower attachment and vanity unit for personal toiletries - no deciding who is going to get the only en-suite bedroom in this villa! Shower room, directly across from the second twin bedroom with shelving for toiletries. A water cooler unit is provided for instant cold water, many guests say how convenient this is having cold drinking water without having to fill the fridge with water bottles. The beautiful mature garden surrounds the villa, there is a large stone built BBQ and shaded patio area with table and chairs for alfresco dining, located just outside the lounge area. Previous guests have commented on how spacious Villa Tyche is both inside and outside and, should you ever have a need for some 'me' time, there are plenty of areas to sit both in the sun and shade with various seating provided. The 8 x 4 pool, (WHICH CAN BE HEATED IN THE COOLER MONTHS AT AN ADDITIONAL COST PLEASE ENQUIRE FOR PRICES), has roman steps for easier access and was re-lined in September 2018. The roman steps are ideal for people with mobility problems, helping little ones get their confidence in the water before venturing further into the pool or for just sitting on and cooling down. The poolside has an extended patio area for sunbeds. Upstairs to the roof terrace, with it's higher vantage point of un-interrupted views of Paphos coastline, ideal for watching the ships go by and sun sets. There are further sun beds and a table and chairs set for relaxation. We try to be as flexible as we can with arriving and departure times if workload allows in the main season and if we do not have any guests arriving or departing on the same day. If you know you have a late flight, why not book a late check out, this will be subject to a charge and dependent on existing bookings but would allow you time to enjoy your final day instead of wondering how you are going to 'spend' time until your flight home. The bungalow is also suitable for people with restricted movement, there are two steps to the kitchen area, one small step to the bedrooms and three steps leading down from the outside patio to the pool, otherwise the accommodation is all on one level. Air con is fitted throughout the villa with additional ceiling fans in the master bedroom and lounge area. Secret Valley is an ideal location for 'chilling out' and spending quality time with friends and family. Secret Valley is a very central location for touring the Island and also approx 15 min drive from Paphos Airport so your holiday begins sooner. I lived in Cyprus with my parents and love the 'laid back' atmosphere We loved this villa, first because the Secret Valley,Kouklia area is very pretty and then its' seclusion, without looking for it you wouldn't know Villa Tyche existed. The villa is just off the road that goes around this part of the estate, with block paving access to only three villas, Villa Tyche being the last one. Villa Tyche overlooks the estate and coastline down towards Paphos - whilst the coastal views are also evident from the ground floor the roof terrace is a higher advantage point to watch the excellent sun-sets or watch the planes arrive (never thought I would have been interested in that!) The villa itself is all on one level, two of the bedrooms have their own en-suites and the third bedroom has a shower/toilet room across from it - no queuing for bathrooms here, which was/is ideal for my growing family all wanting their own 'private' facilities. If you're looking for a peaceful holiday, listening to bird song, taking in the wonderful views but central to touring Cyprus - put Villa Tyche on your shortlist. We know that luggage space is limited so we provide free pool towels, we ask that guests clean the towels on their departure for the next guests to use. The master bedroom has its' own veranda (balcony) looking out on to the garden with a bistro table and chairs set. Villa Tyche is ideal for people with walking difficulties or wheelchair bound. The main entrance is via large double doors. There is one step leading up from the living area to the bedrooms There are two steps leading from the living area to the kitchen The area from the living area to the outside patio is level, with two steps leading down to the pool area. Ideal for people with walking/mobility issues. Beautiful pool and superb views. We're so glad you enjoyed your stay. This villa is amazing and a lot of consideration has been given to the furnishings and equipment. It is well laid-out, with air conditioning in each bedroom and the main living space, plenty of seating (both inside and out), comfortable beds and a well-equipped kitchenThe games, DVDs and iPod docking station provided are a thoughtful extra touch. Having 3 toilet/shower rooms for a 3-bedroom villa is a great advantage, especially when there are 6 people getting ready for an evening out. The garden and pool area are lovely, with plenty of comfortable sun loungers and a pool-side shower. The roman steps into the pool are much better than the metal rungs you find in some pools, which can get far too hot in the sunshine. The pool area gets sunshine from early morning until sunset, however the outside seating area gives shade for the entire day and there is often a welcome breeze from the sea on hot days. We would highly recommend watching the dramatic sunsets from the sun terrace and there are fantastic views down to the sea from both the sun terrace and the pool side. To top it all off, Bill and Kathy who manage the villa are very helpful, friendly and attentive and make a special effort to ensure that everything is perfect for your stay. Hi Elaine, so glad you enjoyed your stay and the pool. It will be lovely to see you again. Thank you for taking time to submit a review, we really appreciate it and for looking after the villa during your stay. Take care and see you soon!! We have just enjoyed the most amazing week at Villa Tyche! On arrival, the villa was spotlessly clean throughout and offered everything you could need for self catering needs; from tea cloths and pegs to a fabulous brick BBQ and comfortable beds! The sunsets from the roof terrace were beautiful and the villa felt private, but not cut off from the surroundings. I'm so glad you enjoyed your holiday. Once again thank you for looking after Villa Tyche during your stay and how lovely you left it on your departure, we really appreciated it. Lovely to meet you and your family. We booked this bungalow after being impressed with the pictures and quick response of the property manager, Kathy. Although, at the time, the property was new to their management and there were no reviews as such we need not have worried at all because the bungalow is every bit as amazing as it looks in the pictures. From start to finish any queries we had were answered quickly and efficiently and nothing was too much trouble. We even managed to pay extra for a late check out which was great as our flight home was not until 10pm on departure day and this gave us an extra day to enjoy. We found the villa quite easily using the instructions we were given which was in a quiet area away from the hustle and bustle but with plenty to do a short drive away. Kathy greeted us warmly the morning of our arrival and checked we had everything we needed. We used facilities at Aphrodite Hills resort just five minutes away which has a good selection of restaurants, shops etc and in Kouklia Village nearby where we visited the shop and also Gabriel's Taverna which is excellent. There is also a craft shop here which was very good. Troodos Mountains are a short drive with pretty waterfalls, Omodos village for the crafts and restaurants (Kantoi for the mezze), lovely forest drive/walks etc. We also visited the Akamas region by jeep safari including the Blue Lagoon, Aphrodite Baths, Adonis Waterfall, Lara Bay, Sea Caves, Banana Plantation and traditional villages en route. Limassol and Paphos are also nice for a day or afternoon out. Plenty of choice of things to do locally and everyone so friendly and helpful. The bungalow itself was perfect for us plenty of different places to relax both inside and outside with the pool and the garden surrounding the property is nicely planted with a large palm tree or two for shade. We used the BBQ which was very good and easy to clean and ate on the roof terrace with views of the sun setting over the sea. Inside the bungalow is everything you could need it really is a home from home. The rooms are spacious with adequate bathrooms and good air conditioning system. The property was very clean, comfortable and furnished and equipped to a very good standard. All in all an excellent holiday experience and we hope to return again in the future. Thank you Kathy and Bill for a wonderful holiday! It was lovely to meet you, thank you for looking after the villa during your stay and for leaving it lovely on your departure, it was very much appreciated. This property is well equipped with all you need for a perfect holiday. Very clean throughout, with ample space in all rooms. Beautiful views especially of the sea from the terrace patio. Having three bathrooms made life easy for us as a larger family. Stunning gardens all around the property with plenty of seating and sun loungers. The brick built bbq was a definite hit when entertaining family. Highly recommend as there is everything you could need in this villa. It’s homely yet still has the lovely holiday feeling to it. Thank you for taking time out to write a review, I know you have a busy lifestyle and really appreciate you taking time out to do so. We're really pleased that you all had a good holiday and made use of the different seating areas with their lovely sea views and, of course the BBQ. Villa was clean throughout on arrival with no problems to any appliances. On the outside there was great views from the roof top terrace and a nice sized pool to swim in with a shaded patio area on the back also. The area it's in is lovely, tucked out of the way of a main road and more then often quite. The closest shop is within a 5-10 minute drive and is about a 30 minute drive to paphos centre. It was lovely to meet you and so glad that you enjoyed your holiday at Villa Tyche. We know that you managed to explore quite a bit of the area whilst you was here. Secret Valley is close to Paphos airport, ideal for when you arrive on late flights and all you want to do is 'get there'. 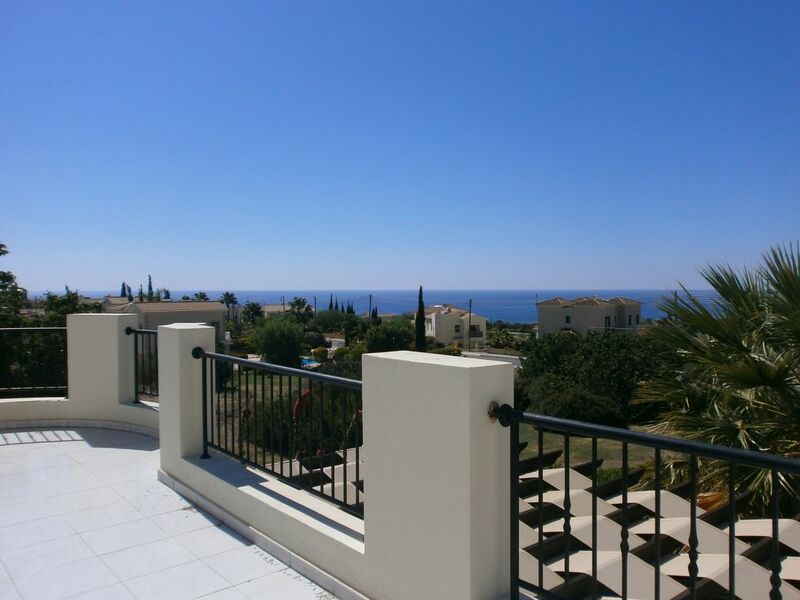 It is a very peaceful area, the villas are located high up (so there always seems to be a breeze, ideal for the hot summer months) with Secret Valley golf course being approx 5 minute drive in the base of the valley. Secret Valley is an ideal area to explore the whole Island. There are coastal path walks that lead to Petra Tou Romiou (Aphrodite Rocks) with beautiful scenery. Nearby are local villages, the nearest being Kouklia, Mandria and Pissouri in the opposite direction, which have numerous bars and restaurants. Kouklia has a couple of tavernas, streets at the centre of the village are closed to traffic during night time for safety and also to allow any guest attractions to perform. Mandria also has a couple of tavernas offering excellent food. Just outside Mandria is a local supermarket which has its' own in-house bakery and offers fresh local produce including meat and fish counters. Pissouri has the beach water sports and sea front restaurants, whilst going higher up to the village you will find a warren of streets with tavernas and good local restaurants. There is also an amphitheater, listen to performers or watch a play under the stars with coastal views as a backdrop. Aphrodite Hills, with it's health club offering massages, facials, gym facilities and tennis are also available is approx just over 5 min drive away. There are mosaics, quad biking, water sports, golfing, churches - all interests catered for. Rates are subject to change There is no insurance included please arrange your own holiday insurance A water cooler is provided, guests should ensure that there is always a full bottle of water left at the side of the cooler for the next guests. Pool towels are provided free of charge but we ask that guests wash them for the next guests' arrival.